This appetizer brings me back to the 80’s. My mom has probably made a million of these in her lifetime. They were a star on her catering menu. Soft rye bread, a blue cheese cream mixture, asparagus and butter. The 80’s version of this appetizer included canned asparagus. I cannot go there, even for nostalgia sake. Instead, I blanched some asparagus spears and the update is even better than my mother’s original version. Sorry, Val. You can make these ahead of time and freeze them and bake them off when you are ready to serve them. 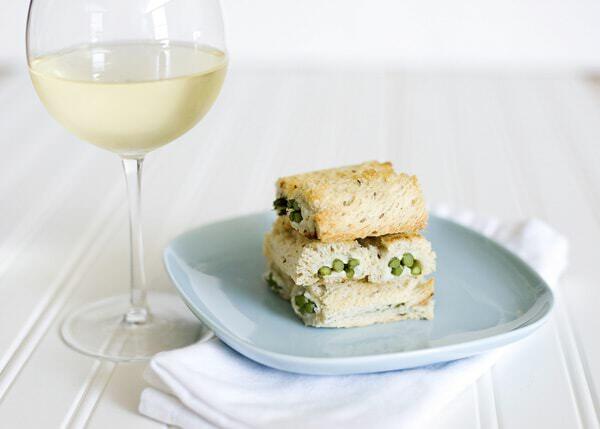 With a glass of white wine, there really is nothing better. 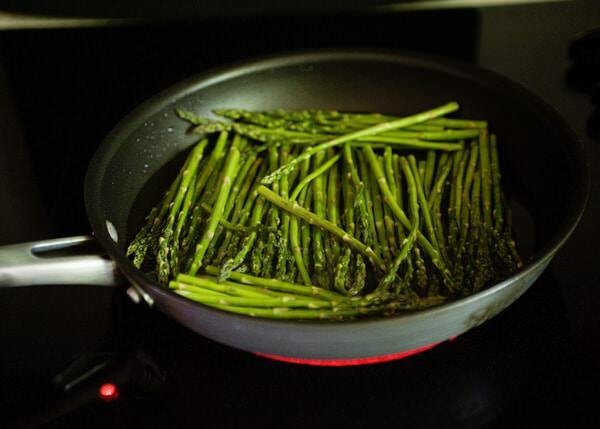 Blanch some asparagus in simmering water. You do not want them to be mushy, but cooked. 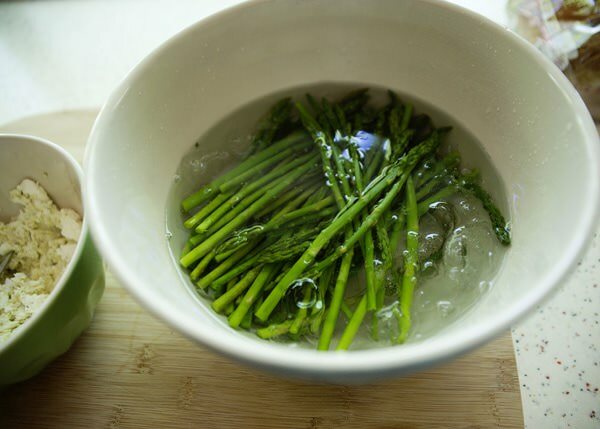 Drop the asparagus in ice cold water to stop the cooking. Drain and dry off. 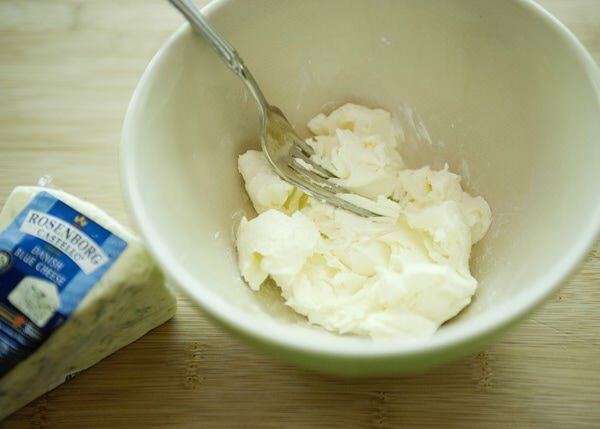 In a small bowl, add the room temperature cream cheese. Mash in the blue cheese and season with salt and pepper. Go easy on the salt, the blue cheese can be pretty salty. 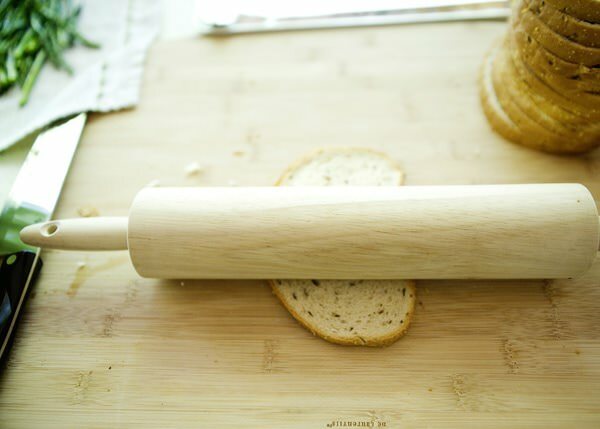 Use a rolling pin to flatten out the bread. 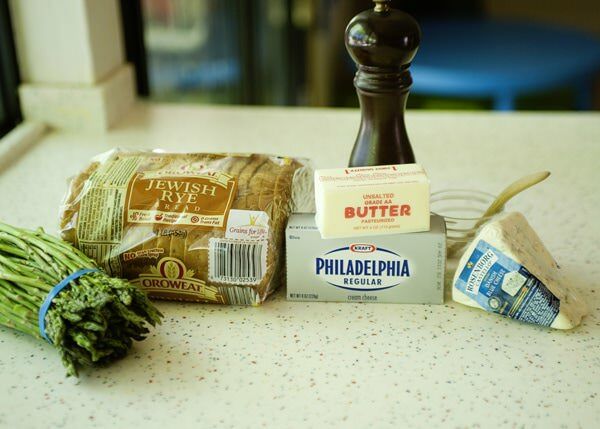 Cut the crust off of the bread and spread the blue cheese mixture to the edges of the bread. Add a few spears of asparagus (these were really thin so I used a few, but if they are large I only use one). 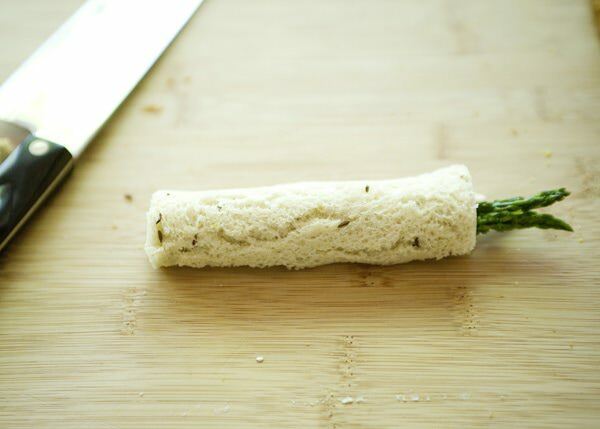 Roll the bread into a roll and trim the ends. 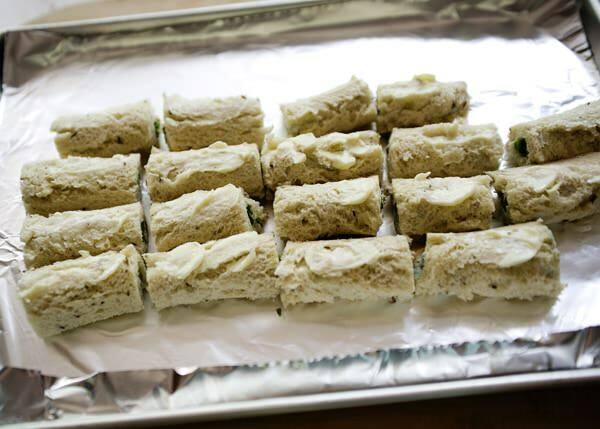 Place the rolls on a baking sheet. If you are going to freeze them, this is the point that you do it at. 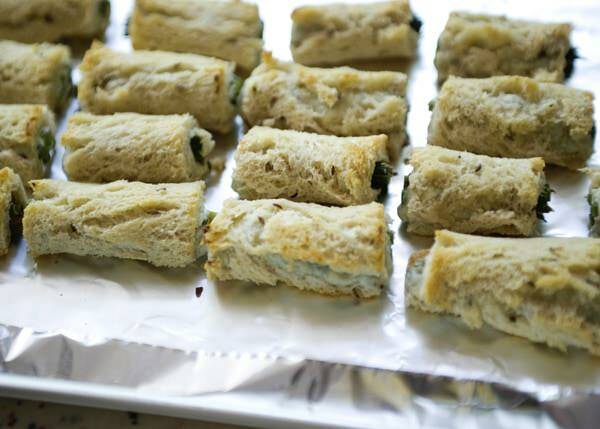 Spread butter on the tops of the asparagus rolls. 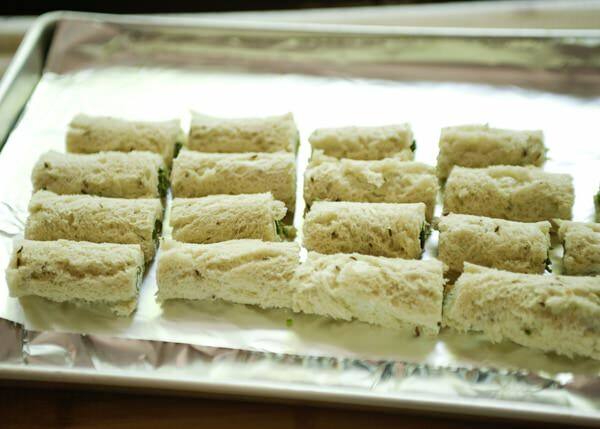 Toast the rolls in a preheated 400 degree oven for about 10 minutes or until the tops are golden brown. What a great recipe. I would have never thought of that. Yet it’s so simple, nice! the best ones usually are the simplest. 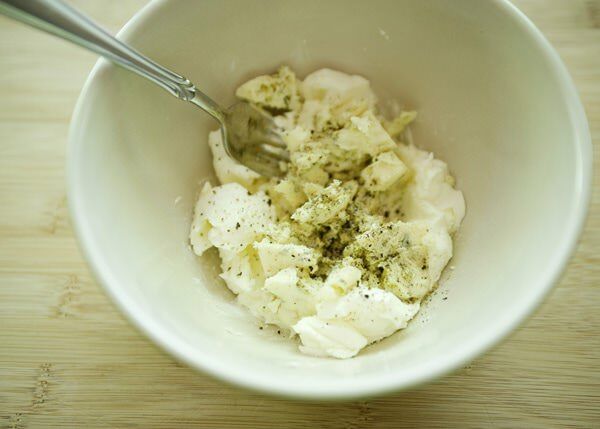 My mom made this too, but without the blue cheese…sounds like a great addition! really? I would miss the blue cheese, but I bet that cream cheese plain would be great too. TFS! 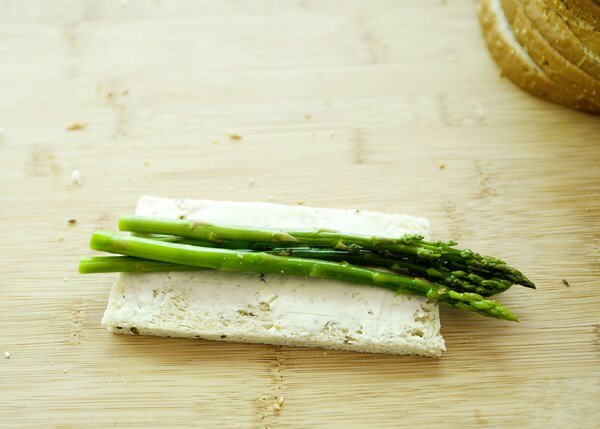 I love blue cheese and I think the flavor combo of the light rye and the asparagus with it sounds delish! That looks absolutely delicious! I think I’ll try that this week. I hope that you do. I crave these. I absolutely can not wait to make these. Thank you so much for the recipe. Very unique. I love anything made with rye bread. You don’t see it in recipes very often. I think I will make these tomorrow. I hope that you like these Teri! I love them. This is very good option to make breakfast delicious and tasteful . You can impress even your partner with this mouth watering recipe. what a creative idea! 🙂 love this. hanks Jenna. 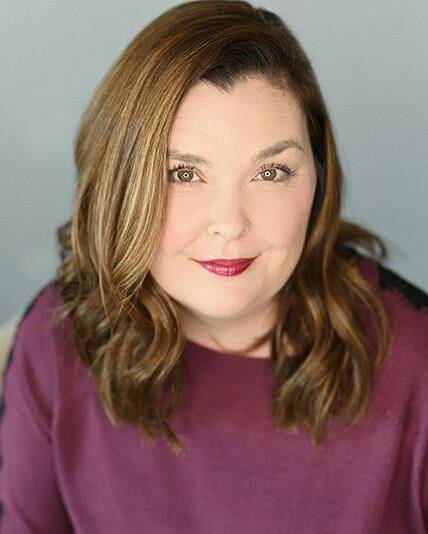 I can’t take the credit, it is all my mom. Oh this looks absolutely delicious! I love adding asparagus in my recipes, it creates a unique flavor and beautiful color. Thanks so much for the wonderful recipe! I have never seen anything like these before! 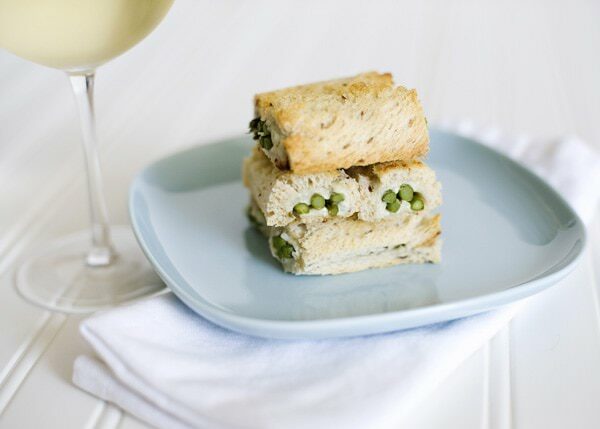 what a great simple appetizer idea, seriously loving this! Thanks for sharing! you are very welcome. These are one of my favorites. You’ve done it again… I won’t rest if I haven’t taste this…! these are so good. You cannot eat just one. Be warned. These look so good! I must make these. this is what I like, back to the normal stalking. These babies are divine. Fresh asparagus… yum. Hope you like it Jim. My mother and grandmother made these as well. The only difference is they would melt the butter and dip the rolls in it. I have three children and as soon as I make these they are begging for more! Great Recipe good to see it is still around! Thank You! I like your way better! Going to try that next time. 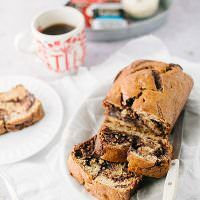 So, I’m new to your blog, but loving your recipes. I can’t figure out how to save this one to my recipe box. Can you help? Not all can be saved to the recipe box. I will have to go through and add all of the recipes manually. My mom used to make this using Spanish cheese , it was amazing, really smooth and tasty, however last year was diagnosed with celiac disease, so she doesn´t cook them anymore, and I really miss them.I might try following your instructions, it can´t be so hard. Have a look at this website, you may find it really interesting. It is not hard at all. I am sure that it will be great with Spanish cheese as well. I´m intending to try tonight, hope it all goes well. I am sure that it will. What more does a busy woman want. Got lots of praise and felt happy.